A group of marine biologists led by the world’s top fisheries scientist, Daniel Pauly, are calling for stronger action to conserve and protect fisheries resources in the Philippines. Pauly is the Principal Investigator of the Sea Around Us at the University of British Columbia and a co-founder of FishBase.org. Together with his team, he produced global, multi-year analyses of fish catches, which have helped the public understand the sad plight of the oceans – particularly the fact that fish populations all over the world are plummeting. “We cannot let fishery resources continue to be overfished; this endangers our food security, both in the short term and in the long term, because overfishing also demolishes the ecosystems within which these resources are embedded,” says Pauly, who also sits on Oceana’s board of directors. 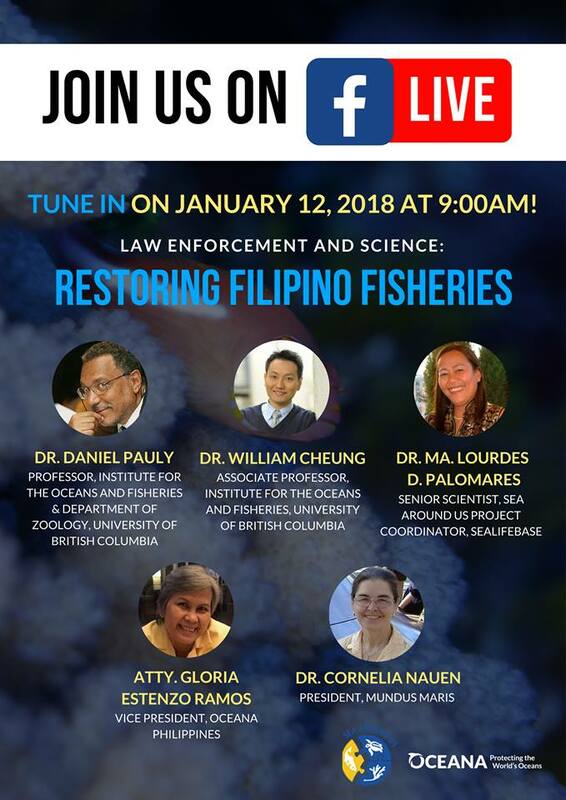 The researcher was at Manila’s Seda Vertis North hotel on January 12, 2018, and led the conference “Law Enforcement and Science: Restoring Filipino Fisheries,” organized by Oceana Philippines with the support of the Sea Around Us and FishBase. Together with Pauly were William Cheung, Cornelia Nauen, Maria Lourdes “Deng” Palomares and Rainer Froese. The scientists shared their thoughts with key stakeholders from government, academia, and civil society on how best to manage fisheries and conserve the country’s vast but threatened marine ecosystems. Blessed with 36,000 kilometers of coast, nearly 30,000 square kilometers of coral reefs and about 1170 square kilometers of mangroves, the Philippines is among Earth’s richest countries in terms of marine biodiversity. In 2014, it ranked eighth among the top fish producing countries in the world, with total production amounting to 4.7 million tonnes of seafood. However, overfishing, illegal fishing, pollution, climate change and the destruction of critical marine habitats are taking a toll on the country’s ability to produce food. According to the Bureau of Fisheries and Aquatic Resources, 10 out of 13 fishing grounds or about 75 per cent of the country’s fishing sites are overfished. The University of the Philippines Marine Science Institute and the Biodiversity Management Bureau further revealed that less than 1 per cent of Philippine coral reefs are in excellent condition – an alarming fact, taking into account that many species of fish and invertebrates live and breed in coral reefs. In 2015, the Philippine Fisheries Code was amended, bolstering enforcement efforts such as requiring fishing boats to adopt vessel-monitoring technologies. The government is now looking at science-based fisheries tools like harvest-control rules and reference points, while setting stiffer penalties for fishing violators. However, enforcement hasn’t been smooth-sailing.